i cannot go anywhere without being followed by at least 6 orphans, hungry for love. i cannot walk into the gates of my orphanages, or through the local villages without being ambushed by 60 children who all want hugs and kisses. i cannot sit down without having my lap instantly filled. and this life for me is heaven. i think i fall in love with canaan more each day. yesterday, i taught the kids how to play tic-tac-toe and hang man in the dirt with a stick; we played for hours. every night before dinner we praise God for about an hour. it is my favorite part of the day; we sing and dance and pray and i can't understand at all much of the time, but i can feel God's presence all around me and in these people. last night the power went out right before dinner which can be quite a disaster when you still have 102 children to feed. so we lined them all up in the dark, and by the light of a kerosene lamp, fed them all. then i held precious gideon late into the night until all the little ones feel asleep and the older ones began heading to bed. sitting there in the absolute dark, i marveled at the fact that here i am in africa, holding an orphan, surrounded by the tangible presence of my Lord, living my dreams; i am so very blessed. this morning i got up and walked back to amani (the other orphanage). its about a two hour, 10 mile walk, but i get a lot of thinking and praying done. :) i bought mandazi (doughnut like things...) for all the toddlers, and when i got home, you would have thought i had been gone for a year instead of 48 hours. i love these little people. even baby josephine started singing when i picked her up; i'll admit, its nice to be missed! after lunch the kids and i walked down to the lake but got caught in the rain (in case you haven't notices, its rainy season). once the kids figured out they were water-proof, however, we had a blast splashing around. it never stopped storming so i decided to stay at amani for the night, which allowed me to bather the little ones and put them to bed and then rock josephine and sweet baby daniel (our newest addition found in the village - sooo tiny!) to sleep. as i listen to the pitter patter of the rain on my tin roof, i feel right at home. and then i realize how blessed i am to feel that. this is my home, amani baby's home in jinja. canaan children's transit in buziika is my home. the nazareth orphanage in masaka is my home. and back in good old brentwood, with all those i hold so dear, is home. no matter where i am, i am always cradled in God's arms, and there i am home. Good morning Katie. We love and miss you very much. Love to read your blog each morning. Many hugs and kisses. beautiful! It's truly a gift to realize that home is where Jesus is - no matter where you are physically! Katie. Today I was shown your book and a video of you in an interview. By the end I was in tears. In 2009 at the age of 14 I first stepped foot in Uganda. I felt the calling to go and like you, look up opportunities on the internet for missions work. I was able to go with a month and worked in Kampala and Gulu and the villages surrounding. It absolutely changed my life which I know you can relate to. I had the chances to go back again this year which I was so blessed and worked with the ACC in Kampala but also visited the Amani Baby Cottage as well as a few other orphanages. I can say with confidence that this is where God has placed my heart. 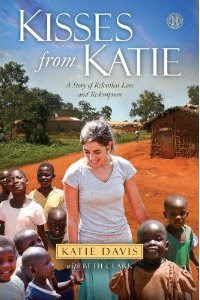 And like today, in being shown your video/book, Uganda comes into my life in new ways on a regular basis. God is working in my life and though I don't know what this means for me yet. Currently I am 18 and just graduated, and in hearing a bit of your story I am blessed.